National Sikh Heritage Centre & Holocaust Museum > News & Events > Events > Happy Vaisakhi! 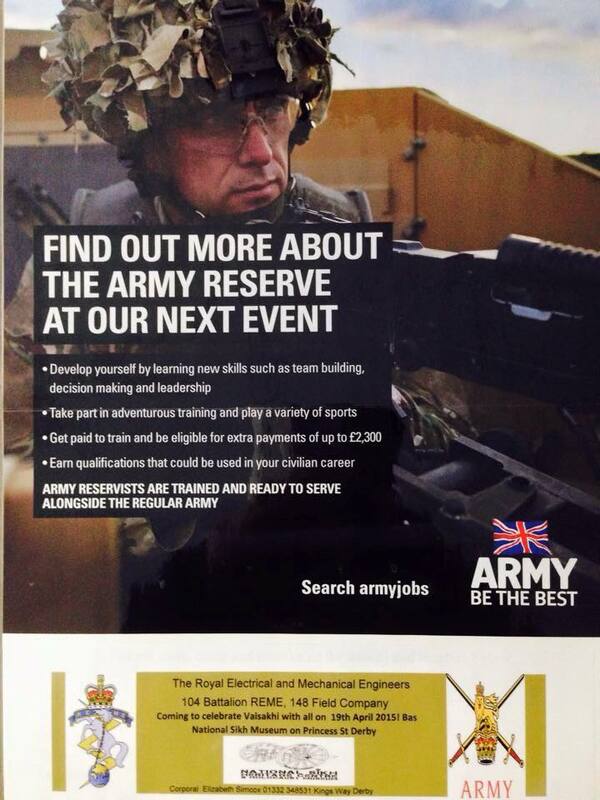 British Army 148 Field Sqd REME-Derby will be coming to celebrate this Sunday 19th April. Please attend. Happy Vaisakhi! 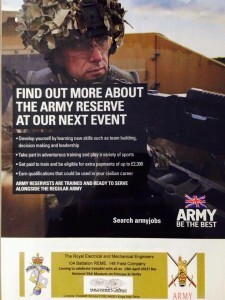 British Army 148 Field Sqd REME-Derby will be coming to celebrate this Sunday 19th April. Please attend. Sikhs are an enterprising community that is promoting the community cohesion and contribution of all. One example is the British Armed Forces Exhibition called “We Were There” provided by British Ministry of Defence and is permanently based at the National Sikh Museum which marks the contribution and relationship of all ethnic minorities ie Muslims, Hindus, Sikhs and many more which made “The History”. Vaisakhi is one of the most colorful events in the Sikh calendar. It’s a time when Punjabi farmers harvest their crops and most importantly, the day on which the city of Anandpur in Punjab saw the creation of the ‘Khalsa’ – The Pure Ones. 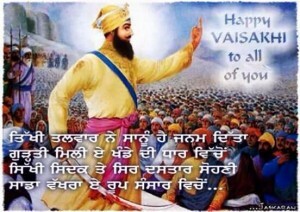 Vaisakhi is the day on which just over 316 years ago the Sikh Nation – the Khalsa (Army of God) was born and Sikhs were given a clear identity and a code of conduct to live by. The event was led by the last living Guru, Guru Gobind Singh Ji, who baptised the first 5 Sikhs using sweet nectar called Amrit but then in turn took the Amrit from them and got baptized himself. This was to mark that there is no difference in between the Guru or his disciple. Around the world at Vaisakhi time, Sikhs reflect on the values taught to them by their Gurus and celebrate the birth of the Khalsa. Vaisakhi is also a seasonal festival of the Punjab, a festival of joy and happiness and the beginning of the Sikh New Year. It coincides with the harvesting season and symbolises wealth and prosperity to the majority of farmers in the Punjab. With crops reaping, the rural countryside of Punjab becomes rich and farmers are ready to spend their hard earned cash. New land is bought and farmers also have a few days to socialise and relax. Local events take place around the villages of Punjab and it’s a time for people to have fun at local festivals (Mela’s). In 1699, the Guru sent hukmanamas (letters of authority) to his followers, requesting them to congregate at Anandpur on 13th April 1699, the day of Baisakhi (the annual harvest festival). He addressed the congregation from the entryway of a small tent pitched on a small hill (now called Kesgarh Sahib) in Anadpur Sahib Punjab India in the foothills of the first belt of Himalaya. He first asked everyone who he was for them? Everyone answered – “You are our Guru.” He then asked them who were they, to which everyone replied – “We are your Sikhs.” Having reminded them of this relationship, He then said that today the Guru needs something from his Sikhs. Everyone said, “Hukum Karo, Sache Patshah” (Order us, True Lord) from a crowd of approx 80,000. Then drawing his sword he asked for a volunteer who was willing to sacrifice his head. No one answered his first call, nor the second call, but on the third invitation, Daya Ram (later known as Bhai Daya Singh) came forward and offered his head to the Guru. Guru Gobind Rai took the volunteer inside the tent, and emerged shortly, with blood dripping from his sword. He then demanded another head. (By this time, people got scared and started to run away) One more volunteer came forward, and entered the tent with him. The Guru again emerged with blood on his sword. This happened three more times. Then the five volunteers came out of the tent in new clothing unharmed. There is a verse in the Guru Granth Sahib Ji (the only Guru of the Sikhs since no more body forms after Guru Gobind Singh) Mirtakh Ko Jivallan Haar.. meaning in simple words that “Only the true Guru can bring back the dead”. Gobind Rai then poured clear water into an iron bowl and adding Patashas (Punjabi sweeteners) into it, he stirred it with double-edged sword accompanied with recitations from Adi Granth. He called this mixture of sweetned water and iron as Amrit(“nectar”) and administered it to the five men. These five, who willingly volunteered to sacrifice their lives for their Guru, were given the title of the Panj Piare (“the five beloved ones”) by their Guru. They were the first (baptized) Sikhs of the Khalsa: Daya Ram (Bhai Daya Singh), Dharam Das (Bhai Dharam Singh), Himmat Rai (Bhai Himmat Singh), Mohkam Chand (Bhai Mohkam Singh), and Sahib Chand (Bhai Sahib Singh). Guru Gobind Singh then recited a line which has been the rallying-cry of the Khalsa since then:’Waheguru ji ka Khalsa, Waheguru ji Ki Fateh’ (Khalsa belongs to God; victory belongs to God). He gave them all the name “Singh” (lion), and designated them collectively as Khalsa (the Pure Ones), the body of baptized Sikhs. The Guru then astounded the five and the whole assembly as he knelt and asked them to in turn initiate him as a member, on an equal footing with them in the Khalsa, thus becoming the sixth member of the new order. His name became Gobind Singh. Today, members of the Khalsa consider Guru Gobind as their father, and Mata Sahib Kaur (not the Guru’s wife, but a member of his household) as their mother. The Panj Piare were thus the first baptised Sikhs, and became the first members of the Khalsa brotherhood. Women were also initiated into the Khalsa, and given the title of kaur (“princess”). Though women are considered and ordered by Guru to be equal in Sikhism, some have been very slow to allow women to serve as the ‘Panj Piare’ who handle Baptism into the order to this day..
“ From now on, you have become casteless. No ritual, either Hindu or Muslim, will you perform nor will you believe in superstition of any kind, but only in one God who is the master and protector of all, the only creator and destroyer. In your new order, the lowest will rank with the highest and each will be to the other a bhai (brother). No pilgrimages for you any more, nor austerities but the pure life of the household, which you should be ready to sacrifice at the call of Dharma. Women shall be equal of men in every way. No purdah (veil) for them anymore, nor the burning alive of a widow on the pyre of her spouse (sati). He who kills his daughter, the Khalsa Panth (Baptised community) shall have no dealings/relationship with them of any kind.Five K’s you will observe as a pledge of your dedication to my ideal. Kesh: Hair unshorn representation of saintliness. Kangha: a comb to keep it clean and untangled. Kara: a steel bracelet to denote one universal God. Kacchha: a piece of practical wear to denote modesty. Kirpan: a steel dagger which represent from two words “Kirpa and “Aan”” Meaning: Mercy and honor. Extended: lookafter the helpless put others before yourself. Smoking/Drinking/eating meat being an unclean and injurious habit, you will forswear. You will love the weapons of war but not to harm any unless attacked first, still find all alternatives to avoid any conflicts. It’s a crime to pickup the sword for the wrong reason yet it’s a bigger crime not to use once all else has failed to protect humanity regardless of their religion or faith. Be excellent horsemen, marksmen and wielders of the sword, the discus and the spear. Physical prowess will be as sacred to you as spiritual sensitivity. And, between the Hindus and Muslims, you will act as a bridge, and serve the poor without distinction of caste, colour, country or creed. My Khalsa shall always defend the poor, and Deg (community kitchen) will be as much an essential part of your order as Teg (the sword). And, from now onwards Sikh males will call themselves ‘Singh’ and women ‘Kaur’ and greet each other with ‘Waheguruji ka Khalsa, Waheguruji ki fateh (The Khalsa belongs to God; victory belongs to God). Political: Many Sikhs have been killed during this period. For example, Jallaniwallah Bagh and more recently in 1978 when 13 Sikhs were killed by an anti-Sikh group. This was one of the key events that led to the genocide of 250,000 Sikhs during 1984 and the decade thereafter.